Get Post List With Thumbnails is an excellent little plugin for self-hosted WordPress sites that allows you to display your recent blog posts as a thumbnail grid of images with support for using the Featured Image thumbnails for a nice clean uniform image from each post. 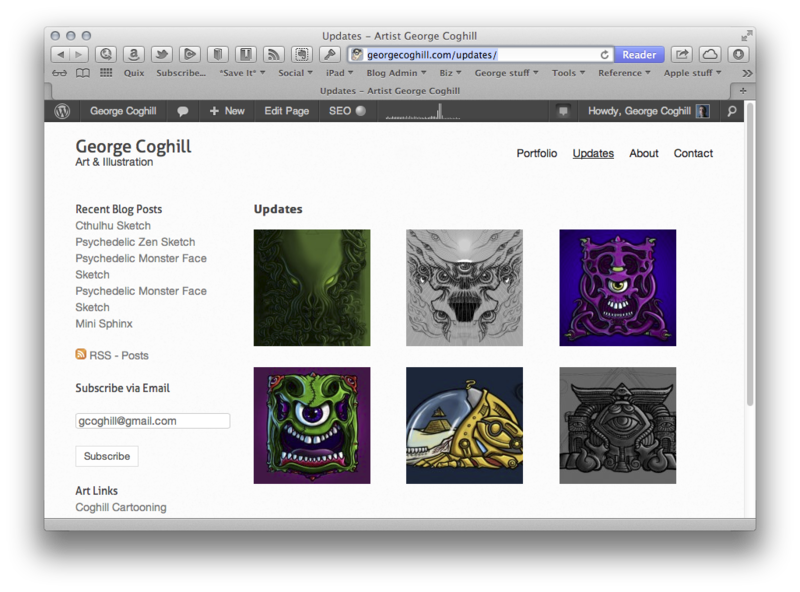 Perfect for us artists wanting to use WordPress for an online portfolio. Highlight is a handy free Mac utility that does one thing: allows you to draw on your Mac’s screen. MacTubes is a great way to watch a bunch of YouTube videos on your Mac. You can set up playlists, search and of course watch the videos. The only downside is that there’s no way to log in to your account and play from your own playlists, but hey—it’s free! Work great, and much better than keeping a browser window open on your second monitor. I typically have Minecraft “Let’s Play” videos by Paul Soares jr. playing on mine. Not sure why, but it’s nice relaxing background entertainment for working late night. I’ve recently started meditating, and came across this excellent introduction and manual to meditation, Mindfulness in Plain English which I discovered via Reddit. It is a superb introduction to meditation, and even better, the website offers up the text in web, PDF and ePub (iBooks) formats. For free!